Doing your best with money and exchange rates in Granada means you need to know about the Euro, banks, ATM's, credit cards and travelers checks. Understanding your best options and preparing for them before your trip can save you a significant amount of money. If you are looking for the current exchange rate you can find it through XE.com's currency converter or the graph below. Keep in mind that the rate will generally be a little worse than what you see on either of these examples. If you want to see more of what the Euro looks like you can do so below. Every bit counts, and below I'll cover the basics to saving those bits. Note the absence of the UK, Denmark and Sweden, which recently voted to keep their own currency rather than change to the Euro. Otherwise the Euro has made things a lot easier for travellers who now do not have to exchange money every time they cross a different border. While many miss the peseta few would disagree that coins are now easier to manage. Around 1992 Spain introduced a whole new set of coins for the peseta. Until the switch to the Euro you had to manage almost two of every coin (i.e. : two types and sizes of 25 peseta coins, two types and sizes of 50 peseta coins, etc.). To make it worse there were many machines for drinks, food, etc. which only took one type of coin. 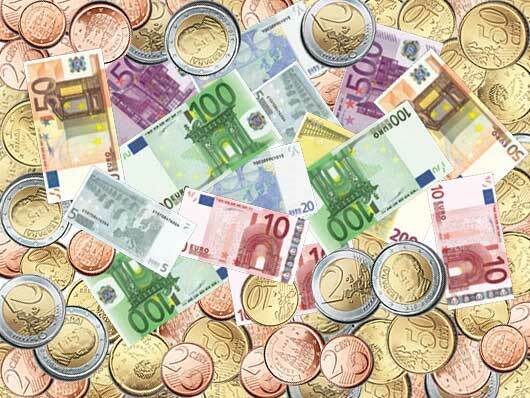 So what does the Euro look like? All coins share the same front but there is a different design for each country on the back. There are also different sizes and thickness of each coin so they are easily distinguished from one another. Below are photos of each of the eight Euro coins. Place your mouse over each one and await a second to see what the back looks like in Spain. Below is the set of seven Euros in bill form. There are different sizes for bills so they are easily distinguished from one another but unlike the coins they do not have a different reverse side for each country. I haven't seen too many of those 500€ bills yet! Visa, American Express and Master Card. You'll be just fine without the Master Card, though. $100 in cash, and plan to come back with all of it. My personal checkbook...why? With an American Express green & white card you can go to the nearest American Express office and cash a personal check. I did make the mistake once of bringing my American Express Blue card instead of the old green and white. Seems they will only cash your personal checks at the office with the green and white card, so keep that in mind if you plan to go this route. Banks are generally open from Monday-Friday from 8:30am-2pm and sometimes on Saturday from 8:30am-1pm. From May to September they are often closed on Saturdays. Expect to wait in line much longer than you likely wait back home, and in some places you need to take a number and wait your turn. You need your passport to exchange money and some banks will allow you to use your credit card to make a cash advance. As I mentioned above, all banks will charge a commission when exchanging money or traveler's checks. If you need to exchange money at night or some odd hour try El Corte Inglés or a nicer hotel, although the rates will be less favorable. In every case it will be better to use an ATM than change money in a bank. In every case it will also be better to change money in a bank rather than an exchange house. Mobile phones - you can recharge your mobile phone at any ATM, which you cannot do with a Visa or ATM card from outside of Spain in most cases. You can also get a contract phone instead of pre paid or tarjeta, phone, which will be cheaper in the long run. Some offices for Vodafone, Amena and Telefonica may tell you that you need a NIF (like a social security number), but other offices will let you set up a contract using your passport number. Utilities - some practically require that you have a bank account, and if not setting up an automatic draft from your account is much easier than going to the bank or a central office during set hours, waiting in line and paying cash. Health Insurance - almost every company covering foreigners requires a bank draft for health insurance and will not make other arrangements. Bank fees - avoid being charged the transaction fee from your bank back home every time you take out money. Getting paid - whether you're working legal or not it's always good to have a bank account where your employer or the person paying you for contract work can make a transfer from their bank. Helps with the safety issue mentioned above as you don't have to carry a large sum of money home with you. Opening a bank account as a non-resident in Spain is very simple. You will need to open a cuenta no-residente, or a non-resident account. Once you become a resident you can quickly change it over to a resident account, generally with no charges. They require a picture ID and most will accept a driver's license from home although a passport will make it a little easier. Some banks have different charges for non-resident accounts while others offer the same services (and fees) regardless of whether you are a resident or not. Cajas, much like credit unions in the U.S., offer cheaper fees but may charge you for other things when opening a non-resident account. I took into account not only the fees but also the banks network of ATM's or cajeros automaticos, to avoid fees for withdrawing from machines outside of my banks network. All offered online banking at no charge, although there may be some which charge a fee for this.. When comparing places to exchange money always check the rate and the commission, especially in currency exchange houses. Some places offer better rates but charge a higher commission. You'll have to do the math yourself, but it is easy to see how a $6 commission on $100 exchange could outweigh the 0.2 difference in rate. Unless you desperately need Euros exchanging at an excahnge house, the train station or airport should be avoided. If you are looking for an approximate exchange rate for today check out XE.com's converter or the graph above. With the current rates it is no longer so "cheap" to travel in Spain. I miss the days of the peseta.